Recent advances in robotics technology make it possible to create prosthetics that can duplicate the natural movement of human legs. This capability promises to dramatically improve the mobility of lower-limb amputees, allowing them to negotiate stairs and slopes and uneven ground, significantly reducing their risk of falling as well as reducing stress on the rest of their bodies. That is the view of Michael Goldfarb, the H. Fort Flowers Professor of Mechanical Engineering, and his colleagues at Vanderbilt University’s Center for Intelligent Mechatronicsexpressed in a perspective’s article in the Nov. 6 issue of the journal Science Translational Medicine. For the last decade, Goldfarb’s team has been doing pioneering research in lower-limb prosthetics. It developed the first robotic prosthesis with both powered knee and ankle joints. And the design became the first artificial leg controlled by thought when researchers at the Rehabilitation Institute of Chicago created a neural interface for it. In the article, Goldfarb and graduate students Brian Lawson and Amanda Shultz describe the technological advances that have made robotic prostheses viable. These include lithium-ion batteries that can store more electricity, powerful brushless electric motors with rare-Earth magnets, miniaturized sensors built into semiconductor chips, particularly accelerometers and gyroscopes, and low-power computer chips. The size and weight of these components is small enough so that they can be combined into a package comparable to that of a biological leg and they can duplicate all of its basic functions. The electric motors play the role of muscles. The batteries store enough power so the robot legs can operate for a full day on a single charge. The sensors serve the function of the nerves in the peripheral nervous system, providing vital information such as the angle between the thigh and lower leg and the force being exerted on the bottom of the foot, etc. The microprocessor provides the coordination function normally provided by the central nervous system. And, in the most advanced systems, a neural interface enhances integration with the brain. Unlike passive artificial legs, robotic legs have the capability of moving independently and out of sync with its user’s movements. So the development of a system that integrates the movement of the prosthesis with the movement of the user is “substantially more important with a robotic leg,” according to the authors. Not only must this control system coordinate the actions of the prosthesis within an activity, such as walking, but it must also recognize a user’s intent to change from one activity to another, such as moving from walking to stair climbing. Identifying the user’s intent requires some connection with the central nervous system. Currently, there are several different approaches to establishing this connection that vary greatly in invasiveness. The least invasive method uses physical sensors that divine the user’s intent from his or her body language. Another method – the electromyography interface – uses electrodes implanted into the user’s leg muscles. The most invasive techniques involve implanting electrodes directly into a patient’s peripheral nerves or directly into his or her brain. The jury is still out on which of these approaches will prove to be best. “Approaches that entail a greater degree of invasiveness must obviously justify the invasiveness with substantial functional advantage,” the article states. 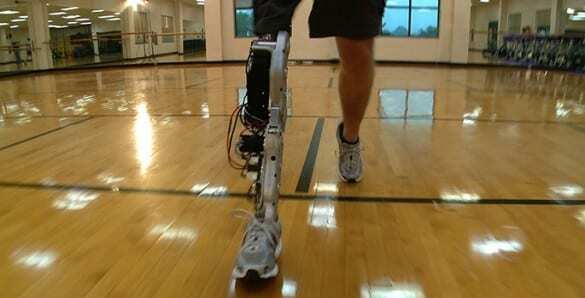 There are a number of potential advantages of bionic legs, the authors point out. April 8, 2019 - Emerging Trends In Cognitive Systems ForbesIntroduction. From automated to autonomous and now cognitive, a paradigm shift is taking place in the design principles of machines, matter, methods and more. April 8, 2019 - Amputees face complicated system getting help paying for artificial limbs CBC NewsA Pointe-du-Chêne man who lost his leg in a motorcycle accident in 1997 uses a prosthetic leg so worn out that parts of it are wrapped in duct tape. March 29, 2019 - How AI and machine learning are changing prosthetics MedTech DiveImagine a prosthetic arm with the sensory capabilities of a human arm, or a robotic ankle that mimics the healthy ankle's response to changing activity. December 10, 2018 - 3D-Printed Custom Robotic Prostheses: Interview with Easton LaChappelle, CEO and Co-Founder of Unlimited Tomorrow | MedgadgetUnlimited Tomorrow, a medical device startup based in Rhinebeck, NY, is developing inexpensive custom prostheses for upper limb amputees. Their approach. January 25, 2019 - AI Helps Amputees Walk With a Robotic Knee IEEE SpectrumComputer algorithms help prosthetic wearers walk within minutes rather than requiring hours of training. February 7, 2019 - A teen nicknamed 'Hand Solo' built himself a robotic prosthetic arm using Lego pieces INSIDERProsthetic arms don't come cheap. A grasping prosthetic can cost anywhere from around $4,000 to upwards of $100,000, depending on its functionality. Innovative Prosthetics Aim To Make Artificial Limbs Seem Natural - Now. Powered by Northrop Grumman. February 11, 2019 - Innovative Prosthetics Aim To Make Artificial Limbs Seem Natural Now. Powered by Northrop Grumman.Amputees are benefiting from innovative prosthetics that look less artificial and behave more like near-natural extensions of the body. November 29, 2018 - A New Prosthetic Arm Takes the Place of a Phantom Limb FuturismA new robotic limb picks up on the signals that an amputee's brain sends to their perceived phantom limbs. Without any practice, the new arm responds. September 4, 2018 - The Pace Maker -- New Prosthesis Comes Closer to Nature Robotics Business ReviewA new generation of prosthesis is enabling a more natural gate for amputees, thanks to innovative design and motor and. June 22, 2018 - Pain Is Weird. Making Bionic Arms Feel Pain Is Even Weirder WIREDResearchers get a robotic prosthesis to feel pain. But is that something amputees would even want? June 20, 2018 - Bringing a human touch to modern prosthetics The Hub at Johns HopkinsWhen layered on top of prosthetic hands, e-dermis device brings back a real sense of touch through the fingertips. October 4, 2018 - A Neural Network, Connected to a Human Brain, Could Mean More Advanced Prosthetics FuturismTraining a neural net to decode a person's brain signals and send them to a robotic limb led to better, precise control over prosthetics. November 15, 2018 - Being bionic: how technology transformed my life | Technology The GuardianThe long read: Prosthetics have made amazing advances in the last decade – and are slowly changing people's attitudes to disability. October 17, 2018 - Researchers Get a Grip on More Human-Like Prosthetic Hands Robotics Business ReviewResearchers have developed a new mechanical system for prosthetic hands that are strong enough to crush a can, and reactive enough to catch a ball. June 26, 2018 - Low-cost prosthetic foot mimics natural walking The MIT TechA big step for prosthetics: MIT engineers design low-cost prosthetic foot that mimics natural walking. May 31, 2018 - An artificial nerve system gives prosthetic devices and robots a sense of touch Stanford University NewsStanford and Seoul National University researchers have developed an artificial nervous system that could give prosthetic limbs or robots reflexes. January 4, 2018 - Future prosthetic: towards the bionic human The EngineerThe science-fiction vision of robotic prosthetic limbs that can be controlled by the brain and provide sensory feedback is coming closer. May 20, 2015 - Prosthetic Limbs, Controlled by Thought New York TimesThe next generation of prostheses includes artificial arms with flexible fingers sensitive enough to transmit the sensation of texture. January 7, 2019 - Bionic reconstruction: after amputation of a hand, muscles can be repurposed using nerve transfers Medical XpressModern prostheses offer hand amputation patients much greater capability in everyday life than was possible with previous prosthetic reconstructive techniques. January 2, 2019 - Intelligent prostheses and electric aircraft - what to look out for in 2019 Horizon magazineHorizon asked scientists what breakthroughs they hope to see this year. March 15, 2018 - Sensation of Movement Recreated in Amputees' Robotic Arms National GeographicThe discovery may help amputees feel more control over their artificial limbs. June 26, 2018 - New Prosthetic Foot Adapts to Rough Terrain Popular MechanicsAn advanced prosthetic comes equipped with a motor and sensors to adjust to stairs or uneven ground. July 25, 2018 - A Better Prosthetic Foot for the Developing World Inside Science News Service(Inside Science) -- Losing a leg can be profoundly debilitating. And it's especially so for those in developing countries, where most of the world's amputees live. June 21, 2018 - 'E-skin' lets prosthetic hands sense touch and pain Futurity: Research News"After many years, I felt my hand, as if a hollow shell got filled with life again." May 30, 2018 - Truly Cyborg Fingers Combine Robotics With Living Cells GizmodoBy growing muscles on an artificial skeleton, researchers from Japan have constructed an agile and surprisingly durable “biohybrid” robotic finger joint. November 27, 2017 - Thought-Controlled Prosthetic Hand Restores 100 Realistic Touch Sensations Singularity HubA new thought-controlled prosthetic hand delivers realistic touch sensations with signals sent to and from the brain via tiny electrical arrays in the arm. August 1, 2018 - Think You Could Do More if You Just Had an Extra Hand? You’re Probably Right. FuturismResearchers tested volunteers' ability to control a robotic limb at the same time as they used their two natural limbs to complete a task. August 14, 2018 - How 3D Printing Helped Mr. Stubbs, The Tailless Alligator National GeographicNew 3D scanning and printing technology allowed researchers to build a prosthetic tail for a disabled alligator. April 26, 2017 - Click-on robotic prosthesis interfaces with nerves Medical XpressLast Friday, the first patient in the Netherlands received his click-on robotic arm. By means of a new technique, this robotic arm is clicked directly onto the bone. January 28, 2019 - Reinforcement Learning System Automatically Trains Prosthetic Legs | MedgadgetPowered leg prostheses can give amputees the ability to walk for long periods of time and to do so briskly. The reality is that these devices are pretty. May 31, 2017 - This new surgical procedure could lead to lifelike prosthetic limbs Science MagazineRobotic joints could—for the first time—be controlled by opposing muscle grafts. January 11, 2019 - Superhero bionic arm startup gets backing from F1 team Williams The IndependentA robotics startup that designs bionic limbs for children in the style of superheroes has raised £4.6 million from investors including the Formula 1 team Williams. March 1, 2019 - How I Became a Robot in London—From 5,000 Miles Away WIREDWearing a haptic feedback glove, I pilot a robotic hand from across the world, feeling what it feels. The sensation is almost too weird to be real. August 6, 2018 - Researchers in Japan are developing a brain-controlled robotic arm MashableIt's likely the first time robotic prostheses have been controlled directly by the brain. November 19, 2015 - Robotic leg could give amputees better balance Futurity: Research NewsStumbles can be especially dangerous for people with artificial limbs, but a robotic prosthesis that works like a human leg may help users recover balance. February 16, 2018 - Teaching With: 'The Bionic Man' New York TimesThis short documentary examines how robots are poised to change the way we do business and conduct our daily lives. August 21, 2018 - Virtual Reality tricks the brain into adopting bionic body parts ZDNetA robotic limb is most useful if it feels like its part of the body. VR offers a solution. October 31, 2018 - Click-on bionic arm could help amputees do the simple things ReutersEdmund Rath, a 53-year-old from Austria, wants to do simple things such as brush his teeth and slice bread. February 5, 2019 - Dexterous, sentient hand prosthesis implanted Today's Medical DevelopmentsPatient with hand amputation becomes first recipient of an osseo-neuromuscular implant to control a dexterous hand prosthesis. December 18, 2018 - Robots and the Future of Disability and Accessible Technology The MightyThe Mighty's disability editor Karin Willison examines various current and potential robots and bionics that could enhance life with a disability. September 21, 2018 - Another step towards the hand prosthesis of the future Tech ExploristThroughout the years, different solutions have been emerged to reestablish information to individuals with limb amputation. In any case, this data is. May 24, 2017 - Military-funded prosthetic technologies benefit more than just veterans The Conversation USDevices created for *service* members and veterans also help civilian children, elderly people and young adults maximize their mobility. May 12, 2014 - FDA Approval for Robotic Arm Controlled by Muscle Activity MIT Technology ReviewAn electromechanical limb developed by Segway maker DEKA now needs a manufacturer to mass-produce it.